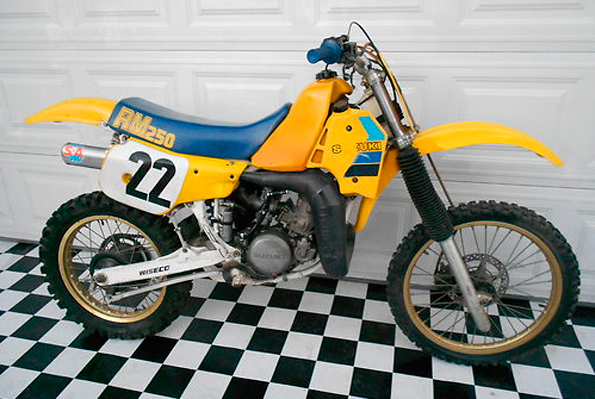 1985 SUZUKI RM250 .What a find a low hour rm 250 in excellent overall condition . Bike is a perfect to do a Restoration or Race in Vintage class .Bike runs great and fires up after a couple kicks . Plactics are in great shape and not busted up . The seat is in near perfect conditon . .This bike is pictured with no dressing on it . Bike comes with a Clean Title . Shipping to any State is not a problem and get this bike shipped for $375.00 to any Lower US State . ( .As always I take CLOSE UP picturers from every angle .Local buyers are welcome to come by and inspect the bike ,just bring cash if you want to take it home!